a girl or woman, usually one of several, who accompanies a bride on her wedding day. To help her with her bridezilla moments and keep her calm when those butterflies start to flutter too much. The pee-helper, teeth-checker, shoulder to cry on and shopping buddy. Now, someone who comes in a definition like that deserves to look glam on the wedding day too! Don't you think? Taking cues from the brides of the west, Indian brides too have begun getting their Bride Tribe together for the wedding celebrations. With a plethora of ideas to choose from, you don't have pick from the usual floor length gowns for your bridesmaids. Indian weddings and all the colors they come with give you a chance to be as creative as you can. Saree gowns, matching anarkalis, lehengas or even mix-matched outfits. The key to having a gorg-looking bridal party is keeping the Indian bridesmaid dresses colour coordinated. You need not keep all the outfits identical, but make sure to keep the colour tones on the same scheme. 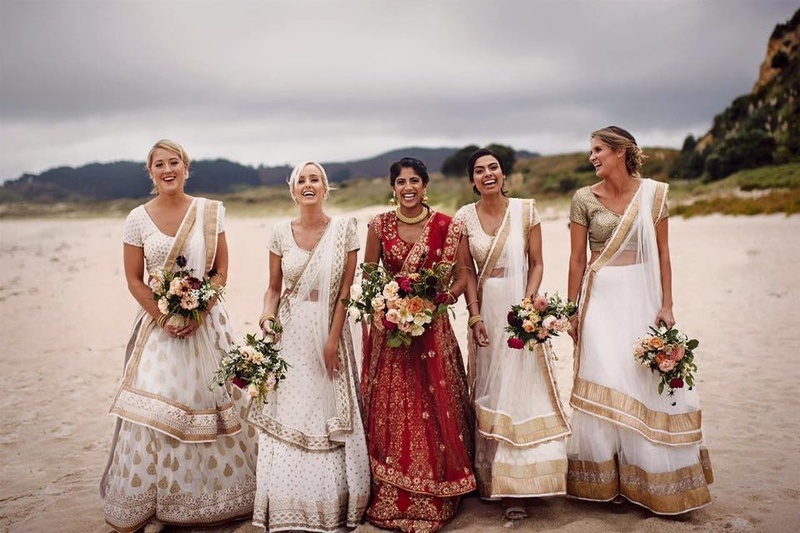 Keep it quirky and get your girls to wear Indian bridesmaid dresses - here are a few ideas!